We know you’re planning your spring garden. Farmer’s Coop has everything you need to get your garden on this spring. Visit us for seed potatoes, onion sets, and plants, organic garden seed, organic plants, organic fertilizer, bedding plants, … all your gardening needs. As everyone knows, our late winter/early spring weather can be a gamble— temps can be spring-like one day and fall below freezing the next. But, the weather extremes should not deter gardeners from planting this time of year. Potatoes are top of the list for planting this time of year. Because potatoes are a cool season crop, they can be among the first crops you set in the ground each spring. Other good go-to cold weather vegetables are root produce such as turnips, beets, and carrots as well as hardy leafy greens like spinach, cabbage, kale, and chard. Bulb veggies (onions and garlic), as well as asparagus crowns, can also be planted at this time. Click here for a planting guide for our area. When the potato plants have bloomed, new potatoes are ready for harvest. For larger potatoes, harvest only after plant tops have fallen over. 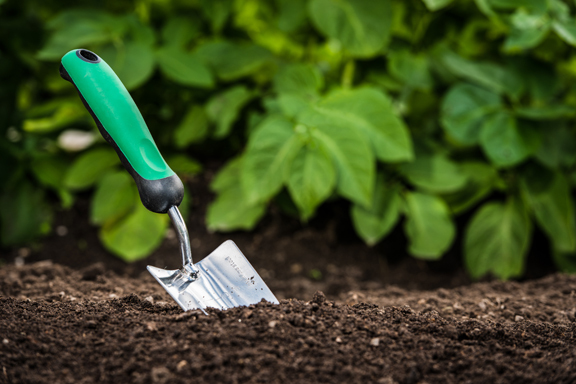 For more information on planting seed potatoes and other spring vegetables in our area, click here. Lettuce, spinach, broccoli, and cabbage are among the Cole Crops planted this time either by seeds or plant starts. Stop by your local Farmer’s Coop for for seed potatoes, onion sets and plants, organic garden seed, organic plants, organic fertilizer, bedding plants, … all your gardening needs. Keep an eye on Facebook and we’ll let you know when new plants arrive. This entry was posted on Friday, December 2nd, 2016 at 6:38 pm	and is filed under articles, Garden, News & Updates. You can follow any responses to this entry through the RSS 2.0 feed. Both comments and pings are currently closed.